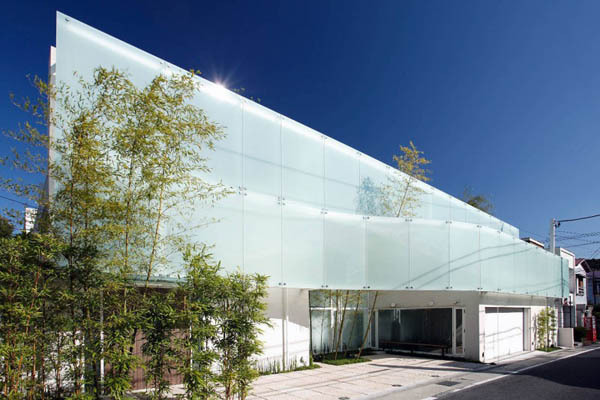 This bright two story contemporary house is located in Kamakura, a city in Kanagawa Prefecture, Japan, about 31 miles (50 kilometers) south-west of Tokyo. Light ad stylish interior design and decorating provide a gorgeous home for contemporary lifestyle. Tokyo-based architectural studio Edward Suzuki Architecture, www.edward.net/ has designed the F Residence that offers spacious and airy rooms with elegant and luxurious decor and allow to enjoy natural and eco friendly environment. 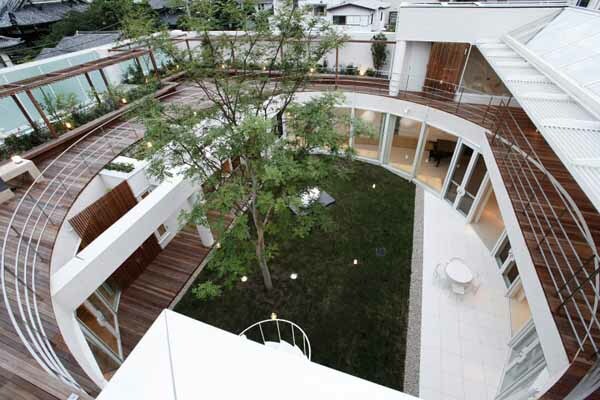 Unique curvy house exterior design, a green courtyard surrounded by patios, terraces and balconies connect modern architectural interiors with the nature, creating this pleasant and natural retreat. Eco friendly bamboo furniture and decor accessories, stylish lighting fixtures and Japanese room add unique character to this amazing eco home, providing beautiful rooms for enjoying relaxing and luxurious lifestyle. F Residence is located in only about a five-minute walking distance from the railroad station. This house sits in a commercial /residential zone. As such, the neighboring houses and shops encroach upon the site rather closely, so much so that from the start the idea to Look Out from the property was abandoned to instead look inward was adopted. Since the client-owner had a vast amount of art collection and wished to display such art in the new house, the theme House Like a Museum became the design generator. The theme, Go in to go out, used in the prefabricated housing system EDDI’s House designed and built in collaboration with Daiwa House Industry, was once again applied to the design of this house and, as a result, the rectangular silhouette of the house was pushed to the boundary limits of the 776 square meter property in the center of which was placed a 15-meter diameter circular patio. The thrust of the planning was to allow each and every room to face and to have a view of this central garden. Near the entrance and up on a mezzanine in a semi-detached fashion is a Japanese Room able to accommodate occasional guests. Next to it and readily accessible from the entrance is the owner’s Private Office. Leading up from the entrance is a sloping gallery-corridor connecting to the Living, Fireplace, Dining, and Kitchen areas. Again, another ramp connects this one-room like space to the elevated Master Bedroom with its private water closet. From this elevated area a staircase leads to the Family/Home Theater space adjacent to the Children’s Bedrooms and Family Bathroom on the second level. On the south of these bedrooms spread a spacious garden terrace overlooking the circular patio below. Finish material for the exterior is basically diatomite over exterior insulation, while for the interior it is predominantly Japanese stucco-paint for walls and ceilings and either bamboo laminates or limestone for the floors. 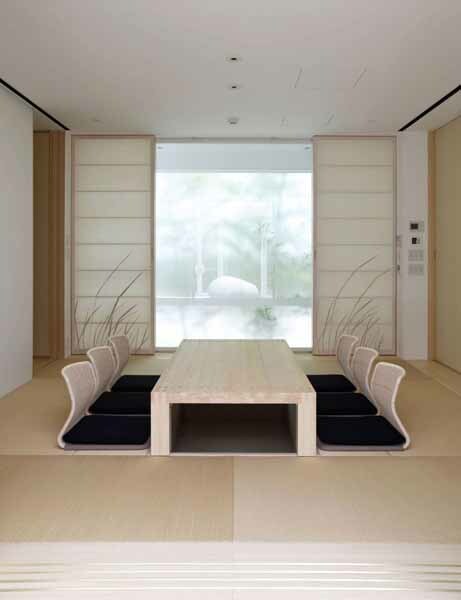 Bamboo laminates are used for all built-in and movable furniture as well, the reason being bamboo, in contrast to wood, grows much more rapidly and hence more eco-friendly. 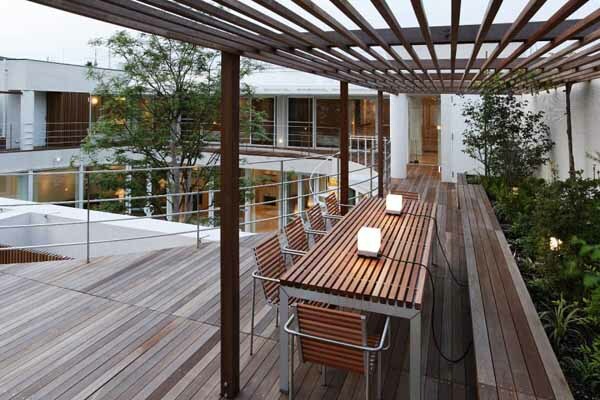 In the same vein, much effort has been made to borrow from and apply the wisdom of traditional Japanese house design vocabulary such as Engawa (peripheral corridor) that fuses or separates as required the inside and the outside, Tsuboniwa (tiny patios), Hisashi (roof overhangs), Tsuufuu (cross ventilation), selected use of evergreens and non-evergreens, roof gardens for extra geothermal insulation—all basically passive means of applying natural energy efficiency instead of forced mechanical ways expending unnecessary energy.